Mithral Dihedral is maybe the most striking corner in the High Sierra. The route starts with a few approach pitches to the stunning 250-foot giant dihedral. The climbing is sustained, vertical, and gets harder the higher you climb. If you break this pitch into three of short pitches, its probably 5.9. If you climb it two longer pitches it gets a 5.10b pumpy rating at the top. Bring lots of 1-2.5-inch cams and be prepared for at least one offwidth pod. You then cruise up mostly easy climbing to the summit. If you are going to hike all the way into the Russell Area and camp, you probably also want to tick off the Fishhook Arete, Star Trekin, or Western Front. Which SuperTopo guidebooks include a topo for Mithral Dihedral? The route as seen from Mt. Whitney summit. 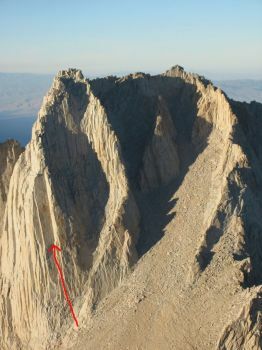 The route as seen from the summit of Whitney.